The newest intelligence shows Kim’s regime has stepped up efforts to hide its nuclear weapons production, say three senior U.S. officials. WASHINGTON — As President Donald Trump issues a steady stream of praise for Kim Jong Un in interviews and on Twitter, a steady stream of evidence that North Korea is still making nuclear weapons has pushed his administration to take a much more aggressive stance toward Pyongyang. The newest intelligence shows Kim's regime has escalated efforts to conceal its nuclear activity, according to three senior U.S. officials. During the three months since the historic Singapore summit and Trump's proclamation that North Korea intends to denuclearize, North Korea has built structures to obscure the entrance to at least one warhead storage facility, according to the officials. The U.S. has also observed North Korean workers moving warheads out of the facility, the officials said, though they would not speculate on where the warheads went. One former senior U.S. official said North Korea frequently moves equipment around to hinder foreign intelligence gathering. "They're trying to move them around so our sensors are confused," the official said. U.S. intelligence assesses North Korea could produce five to eight new nuclear weapons in 2018, according to three current and former senior U.S. officials. That pace is virtually identical to their assessment of the regime's production of about six per year prior to the Trump-Kim summit. Bruce W. Bennett, a senior international/defense researcher at the RAND Corporation and an expert in Northeast Asia military affairs, agrees with that assessment of the pace of production. "Since the beginning of 2018, Kim has surrendered and dismantled no nuclear weapons, but has likely built five to nine new nuclear weapons. So he has not frozen his nuclear program and he has certainly not been denuclearizing; instead, he has been nuclearizing." The Trump administration has launched what it calls a "maximum pressure" campaign against North Korea in response. Public rhetoric, meanwhile, has a different tone. After his June meeting with Kim in Singapore Trump said, "There is no longer a Nuclear Threat from North Korea." Trump tweeted a "thank you" to Kim on Thursday for proclaiming his "unwavering faith" after a South Korean official reported Kim wanted to denuclearize before the end of Trump's first term. The South Korean official said Kim emphasized "that he has never said anything negative about President Trump." "We will get it done together!," tweeted Trump. Friday morning, Fox News aired a taped interview with Trump in which he insisted, "Kim Jong Un said very nice things. He said we want to get denuclearization during the Trump administration." On Sunday, North Korea held its annual Foundation Day military parade to commemorate the 70th anniversary of the founding of the nation on Sept. 9. 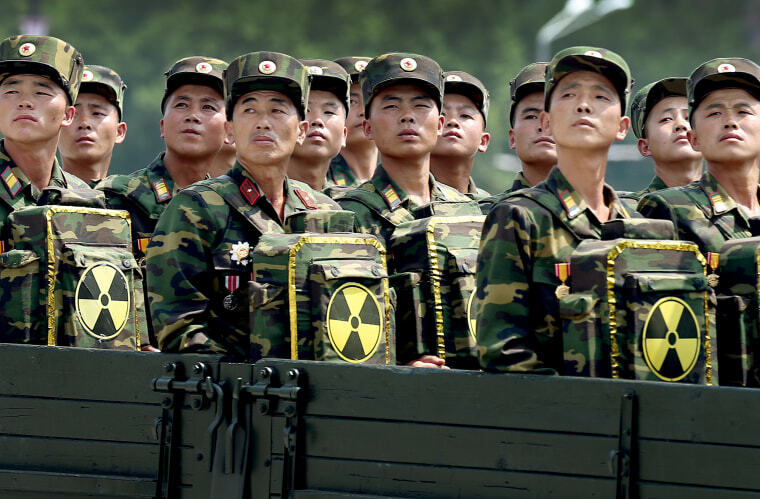 In past years, the Kim regime has used the parade to show off missiles and new technology. But North Korea's recent actions have challenged the Trump team's pressure campaign, and now the administration is looking for ways to bolster it. The first sign of the shift will be at sea, officials said, where an international maritime coalition will step up its efforts to expose ships and nations that are evading sanctions with illegal transfers of goods between ships at sea, according to three senior U.S. officials. NBC News reported Wednesday that China has escalated both legal and illegal trade with North Korea since the Singapore summit, in defiance of sanctions. North Korean trucks are once again rolling over the border, Chinese tourists are flying to Pyongyang, and China has accepted shipments of North Korean coal by sea. With China relaxing its enforcement of sanctions, the U.S. will be hard-pressed to find leverage against North Korea. The international coalition, which includes military ships from the U.S., UK, France, Australia, New Zealand, Japan, and South Korea, has already been patrolling the waters for several months, but there is now an effort to "go active," according to one senior U.S. official, meaning the coalition would begin to publicly denounce individuals who violate the sanctions at sea. "There is an interest in getting more ships and aircraft to participate," one senior U.S. official said, adding that the hope is partner nations will also enhance their presence. "It is about enhanced coordination on U.N. sanctions enforcement," the official said, including sharing intelligence with partners. Japan on Friday announced plans for its naval forces — along with the United States — to operate out of Kadena air base to monitor and conduct surveillance of “illicit maritime activities” by North Korea, but did not offer more details. James Faeh, a former Pentagon desk officer focused on Korea, warns that more sanctions and shaming those who violate sanctions is not the way to force North Korea to denuclearize. "This is highly unlikely to work," he said. "Keeping pressure on North Korea in a tangible way is the right path forward, but that has to involve outreach to other countries in the region and holding their feet to the fire about their cooperation with the brutal North Korean regime." It's unclear whether new intelligence about North Korea's continued nuclear activity played a role in Trump's last-minute decision to pull Secretary of State Mike Pompeo from making a scheduled visit to Pyongyang for talks. Two people familiar with the matter said Pompeo, who'd become deeply familiar with the intelligence on Pyongyang as CIA director, went into talks with North Korea deeply skeptical that the effort would work, and the process has since only solidified his belief that it won't. Officials said he's far more optimistic that the U.S. could cut a deal with Iran. A former senior administration official briefed on the negotiation process said of Pompeo pulling back his trip to Pyongyang: "They're confronted with mounting evidence on all fronts that the North Koreans aren't cooperating." Another former senior administration official said Trump didn't want another news cycle with bad headlines out of North Korea before the midterms because that is one of his big foreign policy talking points. "It was increasingly obvious that the whole effort isn't going anywhere," the official said. Pompeo was snubbed by the North Koreans during his last trip to Pyongyang and risked making another trip there with nothing to show for it, the official said. Pompeo named a special envoy to the North Korea issue, Steve Biegun, who is scheduled to visit Japan, China and South Korea next week in his new role. The U.S. has yet to get China to play what administration officials see as a constructive role in diplomacy with North Korea. And Trump's outreach to Pyongyang has been complicated by strains in the U.S. relationship with South Korea. From the administration's perspective, South Korea has made a series of diplomatic slights to Trump — from seating arrangements for Vice President Mike Pence at the Olympics to the decision to serve shrimp from a disputed region at Trump's state dinner. South Korea has also made an aggressive push for the administration to take certain steps as part of its North Korea diplomacy. South Korean President Moon Jae-in has pressured the White House to sign off on a declaration ending the Korean War, a move Trump rebuffed this past summer. The rift between the two countries was papered over with the meeting between Trump and Kim, but has worsened now that diplomacy with Pyongyang is at a standstill. Moon called Trump this week and is hoping for a meeting with the president this fall in the U.S. He's also pushing for re-engagement between Trump and Kim. While there's renewed talk among administration officials of a possible second meeting this fall between Trump and Kim, it's unclear how serious the discussions are. South Korean and North Korean officials are scheduled to hold two days of high-level talks in Pyongyang starting Sept. 18. The following week Trump is scheduled to be in New York for the annual gathering of world leaders at the United Nations General Assembly.